The ADA compliant restroom trailers were engineered to deliver the most accommodating restroom experience for all guests. Great for reducing wait times, these multi-stall facilities are ideal for mid-sized events or commercial applications where high demand usage may be in effect. Equipped with a hydraulic lowering system, the 5-Stall ADA is perfect those who need to make special accommodations. 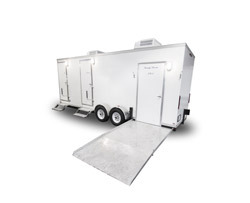 Delivering the best in style and functionality, the ADA 3400 Restroom Trailer combines the best of both worlds. Custom-designed to meet the unique needs of those with special needs, this ADA restroom trailer is the largest of its kind. This trailer adheres to all ADA guidelines and was meticulously handcrafted for a truly unique experience.